Actress Vidya Balan picked out her favourite picture from Isha Ambani and Anand Piramal's pre-wedding party, which she attended over the weekend with husband Siddharth Roy Kapur in Udaipur. 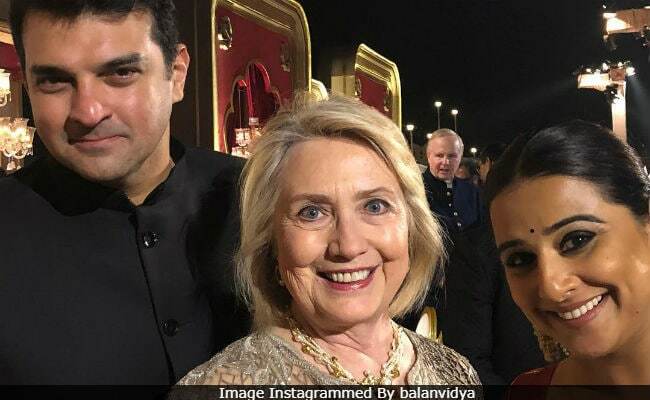 On Monday morning, Vidya Balan shared a 'precious picture' with former US Secretary of State Hillary Clinton and thanked Union Minister Smriti Irani for introducing her to Ms Clinton. The photo also features Siddharth Roy Kapur, whom Vidya thanked for being a 'walking-talking encyclopedia on American politics.' Hillary Clinton landed in Udaipur on Saturday. She was welcomed by Nita and Mukesh Ambani at the venue with a hug and a bouquet. "Precious picture. The first time in my life that I asked to be introduced to someone. Thank you, Smriti Irani for the same. I love Hillary Clinton. A woman who has weathered every storm with equanimity and who never gives up. I felt hopeful while she campaigned to be President and felt a certain hopelessness when she didn't make it," read an excerpt from Vidya Balan's post. "Thank you, Hillary Clinton for all that you are and for being a HERO. And, thank you, Siddharth Roy Kapur for being a walking-talking encyclopedia on American politics and for thereby introducing me to her," she added. Take a look at Vidya Balan's post here. Precious pic !! The first time in my life that i asked to be introduced to someone...Thank you @smritiiraniofficial for the same . I loove @hillaryclinton . A woman who has weathered every storm with equanimity and who never gives up...I felt hopeful while she campaigned to be #President and felt a certain hopelessness when she didn't make it...But in a few days i realized that only when the glass ceiling is shattered can we reach the sky and she broke it for us...and thus paved the way for someone else to reach for the boundless blue. You may find many reasons to dislike her but that's because you are judging her because she dared to travel where most don't...Thank you @hillaryclinton for all that you are and for being a HERO !! And thank you my #siddharthroykapur for being a walking talking encyclopedia on American politics and for thereby introducing me to Her . I couldn't have imagined waking up at 6am to watch the primaries until you happened to me . Vidya Balan has also shared these updates from Udaipur. In Tamil ,Piranda ,means mad...so here's some Parandee-piranda . Nita and Mukesh Amabani's daughter Isha is marrying Anand Piramal, son of Ajay and Swati Piramal. Ajay Piramal is the chairman of the Piramal Group of companies. The couple will take their wedding vows in Mumbai on December 12. Most of the celebs from the film fraternity attended the party over the weekend in Udaipur. Beyonce also performed at the venue.